Heavenly blog! : No. 1655: The faith and freedom of speech are under pressure, also from the courts who are in charge of the judgment in their judges, like with me, Jan Kåre Christensen who has not been treated in court for what I am convicted of, then one can be fooled !? No. 1655: The faith and freedom of speech are under pressure, also from the courts who are in charge of the judgment in their judges, like with me, Jan Kåre Christensen who has not been treated in court for what I am convicted of, then one can be fooled !? The faith and freedom of speech are under pressure, also from the courts who are in charge of the judgment in their judges, like with me, Jan Kåre Christensen who has not been treated in court for what I am convicted of, then one can be fooled !? Hetsing and harassment on the net spread out. But then there should be clear "driving rules"! 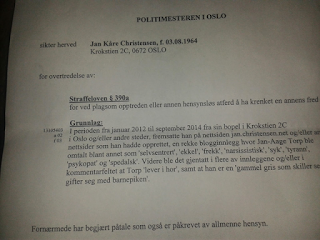 This allowed Norwegian courts to do this in the judgment against me and the heavenly blog. But they neglected strongly and we are left with a judgment that creates more confusion than "clear driving rules" that we so badly need! I am aiming to have written that Pastor Jan Aage Torp is leprosy, horkarl and nasty. Judged to have written "too much" of this, since it has largely come from "crowd" through the word change. Then through actual years, which have not been dealt with in court. Then judging someone to have participated in a word change, although the court assumes that I have not written anything illegal. But because it has become a "too big" amount, it's "illegal"! Understand whoever can, this is both view from the court side. And when it has not been dealt with in court and I have not received a question about this, for which I am convicted. I believe that legal security in Norway is at a low level! Here is the sentence that I know to have written even if the words are taken out of context and therefore give a bad and inadequate meaning. What has been written about me and my family is like "child food" against what I have written. This has not been the case by the court when the police have had an agenda to make me judged! Facts in this case, I have been convicted of, "amount of writings". It has not been a topic and has been discussed by and in court. Then both in Oslo District Court and Borgarting Court of Appeal, which looked only at law enforcement, but then in a very reasoned way when they did not go into the case from Oslo District Court sufficient. For when they judged me, the verdict from Oslo District Court was based on which I had not discussed what I was convicted of, "crowd" of writings! But what I was convicted of was the amount of writing that was not discussed at all in court. That is what makes the trial of a fathers and an justice word. It was not in the trial, it was not discussed in court. I clearly said in Borgarting Court of Appeal where it was all about the use of law that Torp's numbers were completely beyond me (my prosecution). However, Judge Øystein Hermansen did not care about that. This is not a judge worthy. Had this been discussed and I had been convicted. Eg. If the case had come to the Norwegian Supreme Court, the case had been completely different. Then this would have been discussed something that was not in the previous courts that judged me. The verdict will then be a fathers judgment and without credibility, meaning and one will have a feeling that it is enforceable! My lawyer Brynjar Meling wrote to the Norwegian Supreme Court where he pointed out that what I'm convicted of has not been dealt with in court, in other words, the lawsuit against me has been a dad and decided in advance. This is a small excerpt from what he wrote to the Norwegian Supreme Court who rejected the appeal. The above-mentioned inadequacy of the premises of the Court of Appeal is further related to Strl. (1902) § 250 is not mentioned at all in the court's premises, which in itself is also an additional inadequacy given the questions relating to the law of the court of law, see below (quote term). 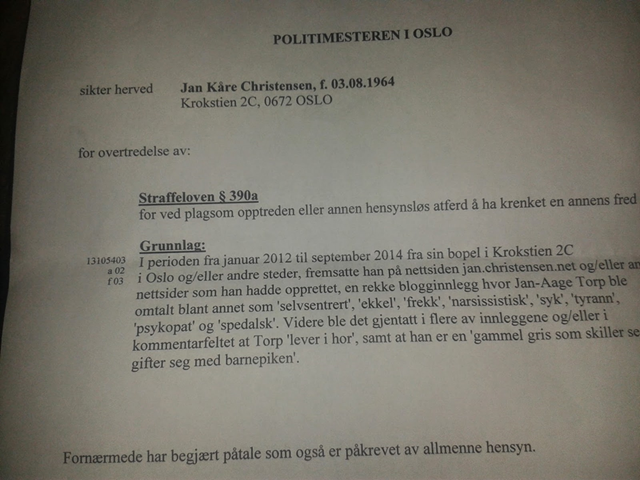 My excellent and very good lawyer Brynjar Meling writes here clearly: "The Court of Appeal - despite this statement - has not at all discussed the extent to which abusive and suspicious opponents of the accused party's verbal attacks have been or what characteristics of the convicted person have been endure for his verbal assault against Pastor Torp. " It is very strong words by my lawyer that the courts, both the verdict of the Oslo District Court and the Borgarting Court of Appeal, have judged me for matters that have not been debated! Then we face a word of justice. And will remind you of "injustice somewhere is a threat to justice everywhere". Martin Luther King Quote. When I have been convicted of something that the court has not dealt with. When the Norwegian Supreme Court rejected the appeal. Section 100 of the Constitution states: "It is the responsibility of the state authorities to provide conditions for an open and enlightened public conversation." When I am convicted of something that the court has not dealt with, this is the perfect injustice, evil and primitive! In other words, when the court has not settled. Judging me for this, is nothing but horrible and a clear word of justice! When they use this judgment in any future court cases to cast others, it will be completely wrong! Then they use a "cheat" sentence and a judgment that is actually a low goal of running a litigation process. To trap others, who will eventually plant there in the end everything is "law"! I see with horror and grief on the continuation if this verdict is not reversed and it is being dealt with again in the judicial system. It's like taking a verdict from North Korea to apply that verdict here in Norway, at such a low level, if not even lower, this judgment is because the actual trial process against me and the heavenly blog is obviously either ruled in advance or Norwegian justice down with "broken" back!